ISRAËL – Jerusalem - Archaeologists working in the Gihon Spring area in the City of David in Jerusalem have discovered many ancient artifacts, including pottery shards, clay candle holders, and figurines dating back to the times of the First and Second Temples. 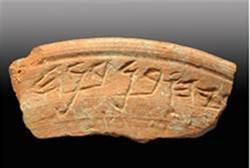 One recently discovered item has aroused particular interest: a pottery shard dating back to the First Temple period that includes part of a phrase etched into its rim. The writing may indicate proof of the existence of a Biblical figure. The partial phrase reads “...ryahu ben Benaya,” a possible reference to the prophet Yecheziel ben Zaharyahu ben Benaya, who is mentioned in the Biblical book of Chronicles 2, in chapter 20, verse 14. However, because the writing is incomplete, the full name cannot be verified. The archaeologists who discovered the pottery shard have dated it to 2,700 years ago – some time between the kingdom of Hezekiah and the destruction of Jerusalem in 586 BCE during the reign of King Zedekiah. Archaeologists have previously found writing in the same area, on pottery as well as in the form of stamps and etchings in stone. Some writing has revealed names, including Gamaryahu ben Shafan (a family mentioned in the biblical texts as well) and Benayahu ben-Hoshayahu. The shard will go on display on Thursday of this week as part of the 14th City of David Research Exhibition. INDE – Tiwa Naga - Officials of the directorate of archaeology, Assam, today dug out a boat-shaped terracotta vessel from Tiwa Nagar atop the Narakashur Hills in Kahilipara here. The vessel was reportedly dug out from the main road that passes by Tiwa Nagar High School . A few pieces of pottery of varied shapes were also discovered inside the boat-like vessel during the excavation. The department of archaeology will be able to tell which era the vessel belongs to only after cleaning the object and its restoration. Singh, who is an assistant professor of Bodoland University, had earlier participated in excavations conducted by the department. “Neel Kamal Singh had noticed a corner of the particular boat-like terracotta vessel slightly protruding from the ground. Doubting it to be an object of archaeological interest, he informed us. Today, a team from our office reached the spot and began excavation from about 11am to 4.30pm. We cannot immediately say what this boat-shaped vessel exactly is as we found it in a broken state and its bottom was completely embedded in the soil. The soil itself had turned blackish because the objects were decomposing. But we have brought it to our office and plan to hand it over to the Assam State Museum after cleaning and restoring it,” said Deepirekha Kouli, director of the state archaeological department. “Big pottery pieces of various shapes along with a circular terracotta object were also unearthed. In fact, these pieces were inside it. These pottery items are also damaged and we do not have immediate plans to hand them over to the museum. After restoration we will study these items and use them for research,” Kouli said. The officials have a hunch that the vessel dates back to the 17th century. “A few months ago we excavated the Nabagarh area of Guwahati. We dug out similar pieces of pottery which were found to date back to the 17th century. 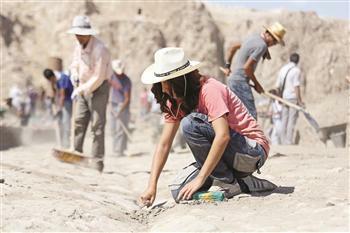 Though we cannot confirm now, the objects found today may belong to the same era,” Kouli said. INDE – Jammu - A wall of the historic Bahu Qilla, one of the oldest forts in Jammu built in 16th century, today collapsed due to incessant rains lashing the city for past few days. After the incident, the Bahu Fort Development Committee (BFDC) protested against the archaeology department and Jammu Development Authority, alleging that the wall collapsed due to lack of proper maintenance and renovation. BFDC President Rajeev Charak said the 16th century fort was built by Maharaja Bahu Lochan and it was the birth place of Dogras. The fort was a prime attraction for a number of tourists. The vista of Himalayan Ranges and the Tawi river provide it perfect backdrop, he said. IRLANDE – Limerick - Samples from skeletons which could date back to the Siege of Limerick may be flown to Miami shortly for testing to determine when they were interrred.The remains, which archaelogists believe could date from the time of the Famine or back to medieval Limerick, were discovered on Friday last during construction work on Nicholas Street. 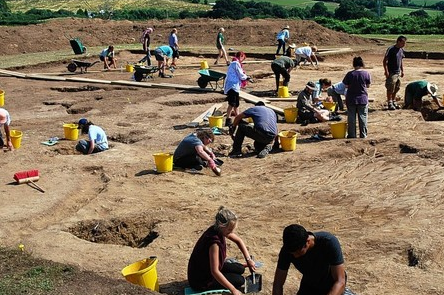 ROYAUME UNI – Ipplepen - New finds from a major archeological dig in Ipplepen — the largest Roman Village in Devon — will go on show to the public for the first time this weekend. A Roman road, square enclosure ditch of Roman date and several round houses occupied during the Iron Age have been discovered so far. Many fragments of pottery, including locally-produced and imported wares such as amphorae from Spain and decorated Samian ware, have also been recovered, along with Roman coins. Bronze Age pottery and flint flakes are also evidence of human activity.